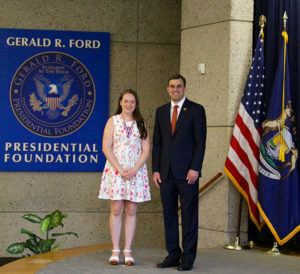 Tag Archive | "Rep. Justin Amash"
Rep. Justin Amash (R-Mich.) announced Academy Night for Third District high school students interested in learning more about the U.S. service academies. Academy Night is scheduled for Monday, November 19, 2018, in the Ryerson Auditorium at the Grand Rapids Public Library. Admission to the academies, except for the Coast Guard Academy, requires a nomination from the vice president, a U.S. senator, or a U.S. representative. Students typically begin the admissions process in the spring of their junior year of high school. More information about the academy nomination process can be found at amash.house.gov. Rep. Justin Amash (R-Mich.) announced Academy Night details for third district high school students interested in learning more about the U.S. service academies. Academy Night is scheduled for Monday, November 20, 2017, at the Gerald R. Ford Presidential Museum, from 7-9 p.m. The museum is located at 303 Pearl Street NW, Grand Rapids. Officials from the United States Military Academy, the United States Naval Academy, the United States Coast Guard Academy, the United States Merchant Marine Academy, and the United States Air Force Academy will provide information about the academies and the application process. Representatives from the offices of Senator Debbie Stabenow and Senator Gary Peters also will be available to answer questions.